I read many posts about this event and the 30 years since, accompanied by charts of the market to put the 1987 crash in perspective. Shown below is what I believe is one of the better charts. 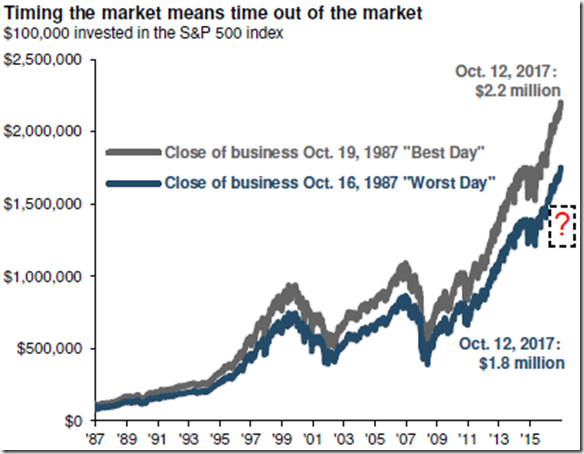 In this chart by JP Morgan, two $100,000 investments in the equity market are simulated, one of which was initiated on October 16, 1987, the day before Black Monday, and the other after the close of business on Black Monday. Today, the investor who arguably had the worst timing over the past 30 years has an annualized return of 9.7%, and the investor who was lucky enough to miss Black Monday has an annualized return of 10.5%. JP Morgan created the chart to highlight how investors shouldn’t focus on the best time to invest, but rather commit to investing in an appropriate way for the long run and watch their money grow over time. The piece that I believe is missing from the illustration is what happened to the investor who stayed out both days and waited for “things to settle down.” While no one can answer that question definitively (I simply inserted a question mark), studies suggest that investors who take this tack don’t return until the market has more than recovered, meaning a lower outcome than the “Worst Day” in the chart. I believe this is very relevant given where we are today. The market is elevated in valuation and more folks are questioning whether now is a good time to get/stay invested in the stock portion of their portfolio. Since we don’t know when the next downturn will occur and assuming a long-term horizon for the funds in question, the answer would seem to be yes. This is not to minimize the risk of a downturn or the feelings of regret from bad timing. In fact, one post I read from Ben Carlson’s work showed the following graph. The graph is shown to demonstrate that even downturns like October 1987 are really just a blip on the map of our financial lives. In 1987, market news was nothing like it is today. We had no Internet. We had the next day’s WSJ and Friday’s 30-minute Lou Rukeyser’s Wall Street Week; we subscribed to a few stock newsletters (delivered by snail mail) and Kiplinger and Money magazines . . . that’s about it. Long story short— she insisted we sell everything the next day (which was also a significant down day); we eventually re-entered the market. So, is now (or whenever you have the funds) the time to invest for the long-term? Yes. But, do we always have to be aware of the “real-time” realities that go along with downturns? Yes!